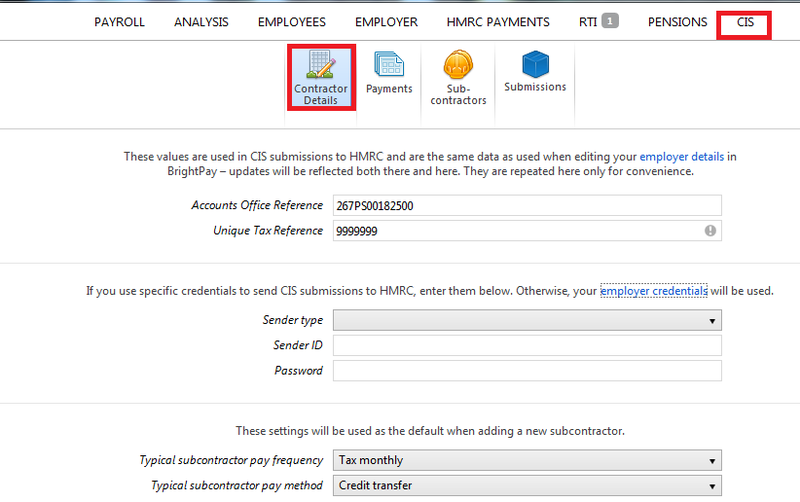 The contractor details used in CIS submissions to HMRC are the same as the employer details in BrightPay. These details are shown in contractor details for convenience, to review these details access the CIS function, click "Contractor Details". Please note, the contractor Unique Tax Reference (UTR) is a mandatory field for CIS submissions please enter it here if it is not already present. Please note, if you use specific credentials to send CIS submissions to HMRC, you can enter them. Otherwise, the employer credentials will be used.